June 16th 1964, early in the evening. A cheeky little lad by the name of Keith Bennett said goodbye to his Mam Winnie, and crossed the road to go and stay at his grans house for the night. He never got there, and that was the last time his Mam ever saw him. Sometimes the children would go to their Grans for the night, it was a regular occurrance, this time was no different to any other. . Winnie, on her way to bingo, walked part of the journey with Keith. She watched him cross the busy Stockport Road, to go to her mothers house, then she continued on her way. When Keith didnt turn up, Gran just assumed that he had changed his mind. As neither of them had telephones, it was only the next morning when Gran went round to her daughters house and asked where he was, that the alarm bells started ringing. Keith had been abducted and murdered by Ian Brady and Myra Hindley, his body was buried on Saddleworth Moor and has never been found. His Mother Winnie Johnson has never been able to put her grief to rest, and continued her quest to find him right up until the day she died. I first met Winnie when Keith made contact clairvoyantly with myself and my sister in law Christine. 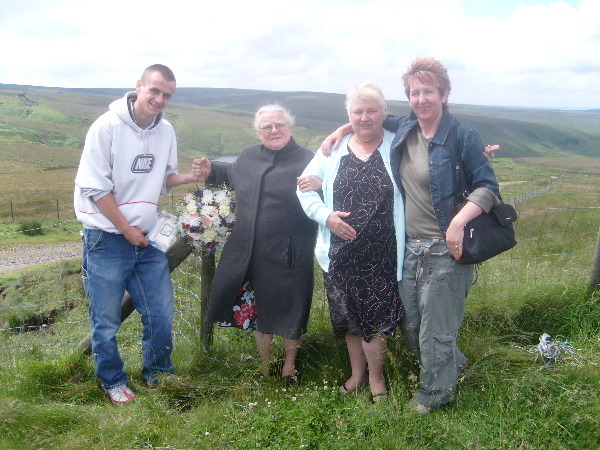 He told us that he could show us where he was buried, and that if we were to go to Saddleworth Moor, he would give us a sign to let us know we were in the right area. He told Christine that he would leave us something yellow and he told me that we would see a red balloon. He also showed me his glasses and said that his Mam still has them. Other psychic images were given to us, something to do with an indian, and a cross, but we had no idea what this meant at the time. Christine had drawn a map from a vision that she had been shown of the area. Armed with this and Keiths information we headed off to the Moors. The Moorland stretches as far as the eye can see, and is really quite breathtakingly beautiful, but trying to locate the spot where Keith was directing us to, was daunting. We were astonished on reaching Saddleworth, to see how vast the place really was. We had a friend with us Anthony Harvison, who was a reporter for our local newspaper, and a Manchester reporter who knew the area. He took us to a place which he told us was the area that he thought we should look. However, It just didnt feel right to us, and so we got back into the car and headed back the way we came, and then we both had a feeling that we should stop in a certain area. We now know this area to be opposite Hollin Brown Knoll, and near to Adams Cross (Keith mentioned a cross). The view matched the vision of Christines map, with water and trees in the distance. There was an unusual rock formation, which the local newspaper chap told us was known as Indian Head (Keith had mentioned something to do with an indian). We started to walk across the moorland, asking for guidance about where we should go. Then we stopped short, as we saw a yellow ribbon lying on the ground, not moving. It was an incredibly windy day, and the ribbon was lying perfectly still. We were amazed to see that tied to the ribbon was the remains of a red balloon (just as Keith had told us). Further visits have resulted in us finding 4 small bakolite type crosses nearby. I have since held Keiths glasses in my hand. Winnie does have these, just as Keith told me she did. Winnie told us that Keith had broken his glasses the day before he went missing at the swimming baths, and she was going to get them repaired, so he didnt have them the day that he disappeared. Winnie advised us to tell the Manchester Police of our findings and so we spoke to Det Sgt Philip Steel who agreed to meet us on the Moors along with one of his colleagues. They spent two hours with us on the Moors and agreed that the information that we had received from Keith was unusual, and that the spot was as likely a spot as they had seen. Subsequent newspaper articles followed this, one of which was 'The People' Sunday Newspaper, who contacted the Police for verification that they had met us there. The printed article included the comments from the Greater Manchester Police Dept who said that they have had lots of people ringing up claiming to have new leads about Keith but this one was being taken very seriously. please note that any money that had been obtained for printed articles in any magazine or newspaper has gone to Winnie Johnson and not for personal gain. Winnie became a very close personal friend, and part of our family and also the Feathers family particularly with Steve Furlong. 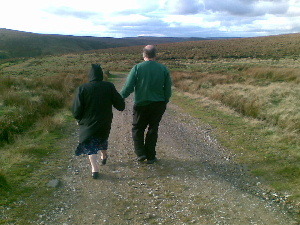 We visited her regularly, taking her to the Moors as often as we could. She liked to go to the Moors because she says she feels near to Keith there. 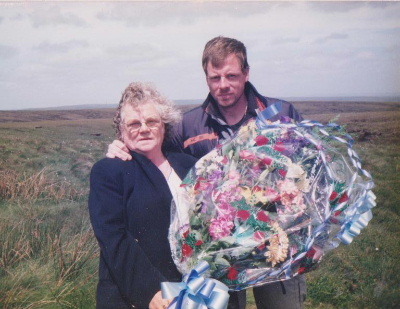 We know that Keith loves to be around his Mum, he has shown this in many ways and through many different Clairvoyants. One of which is Helen Pearson, a gifted Medium from Prestwich, who has been friends with Winnie for a long time. Helen met Winnie in the same way we did, through Keiths insistence that we contact her. In July 2009 the Police issued a statement to say that the investigation to find Keiths remains has been classified as 'officially dormant'. They say that only a major scientific breakthrough or a significant piece of new evidence would prompt a new search. June 2008 on the 44th Anniversary, we took Winnie to lay her wreath, which was made specially for her by her grandaughter this year. The first picture is Jackie's Mum, Betty Hamlett with Winnie standing next to the wreath, flowers and special cards.